Whether or not you’ve spent time in rural areas, almost everyone has their fair share of experiences with poor wireless connectivity. Most of those issues originate from your phone having difficulty accessing a nearby communication tower. Sometimes the interference is geographical, like being on the wrong side of a valley. Other times, there are simply too many trees, buildings, and similar obstructions between you and the signal. In other words, most bad signals are caused by simple obstructions. And when that’s the case, it’s usually easy to solve the problem with a 4G single booster. Depending on the signal you start with, signal boosters can take a 3G and 4G LTE signal and drastically boost it. Not only can you improve connection speeds, you can also get more reliable connections anytime you’re within range of the signal booster. That means fewer dropped calls, and improved voice quality on both ends of the conversation. It means faster downloads and streaming from your mobile devices, and a longer lasting battery life due to your phone not having to work as hard to maintain its connection. It also means far more dependable and rapid text messaging. 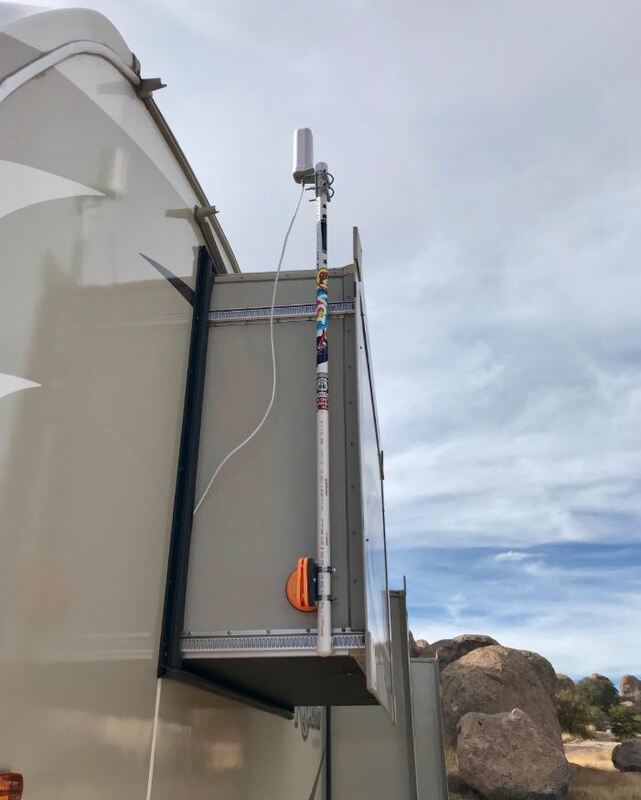 For someone taking an RV on the road, or installing a signal booster in a mobile home, it’s possible to enjoy a signal radius that’s boosted for thousands of square feet. That kind of extra coverage produces fewer dead zones in your Wi-Fi connectivity. Characterized in the simplest way, the RV 65 is a mid-tier signal booster. If you’re willing to throw an endless supply of money at the problem of weak signals, then you don’t have to stop at the weBoost Connect RV 65. But unless you’ve got a particularly rare and unique set of circumstances which are blocking your Wi-Fi connectivity, you’ll never need anything more powerful. Whether you’re trying to take a modestly weak connection and bolster it, or take a devastatingly weak connection and make it usable, the RV 65 has every tool you could need. Part of the way that signal boosters overcome connectivity problems is by helping establish a more direct connection with your local cell towers. In rural areas, it’s common for smartphones have a tougher time reaching cell phone towers. That’s in part due to geographical issues, but also due to the modestly sized antennas within your average smartphone. Signal boosters like the Connect RV 65 make use of sizeable and powerful antennas which can be given special positional advantages. Even if you’re getting a weak signal, the RV 65 can help boost that signal into something much more effective. Additionally, the weBoost can help because those powerful antennae help you better bypass building materials, offer you the ability to be positioned for an optimal signal, and ultimately multiply the strength of whatever connectivity would otherwise be available. The RV 65 is also equipped to help with any number of weather events that can affect signal strength, including snow, snow, lightning, fog, and rain. When the weather stands between you and smartphone bars, the weBoost is extremely effective at helping pull a stronger signal out of environmental chaos. 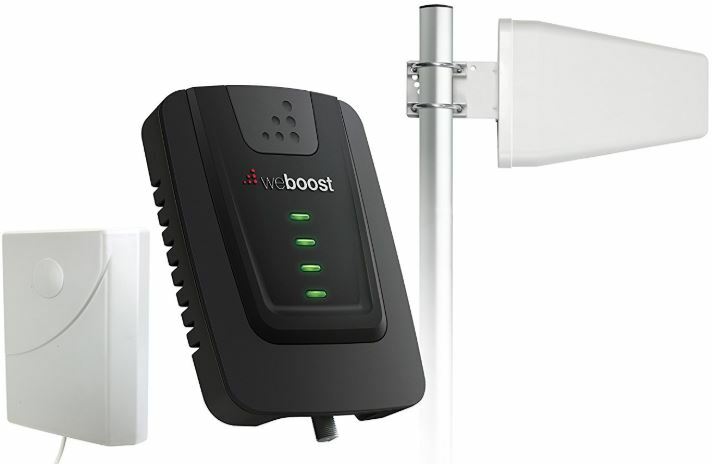 The most important feature of the weBoost Connect series of boosters are their external antenna. Their unidirectional antenna is designed to search for a signal within a 45-degre radius of where they face. After you’ve got a rough idea of where a nearby cell tower is located, you can direct that external antenna to help achieve a much stronger connection then would otherwise be possible. 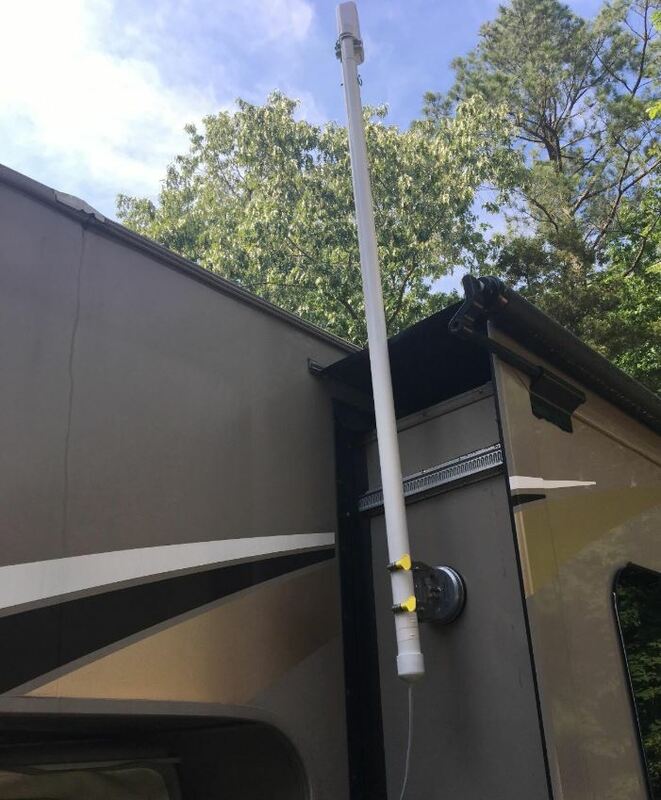 And if height is the primary issue with your connectivity, the RV 65 allows you to run its external antenna up a telescoping pole, extending as high as 25 feet into the air. 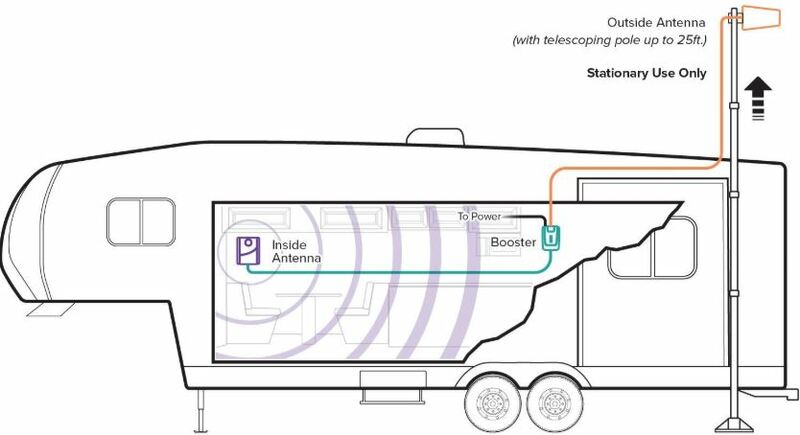 But the weBoost Connect RV isn’t just a giant antenna, it’s also an amplifier made to help boost the signal it receives. That signal is boosted by an impressive +65db, which is roughly 30 times the power you typically see within vehicle-based signal boosters. In other words, you’ll end up with extraordinary signal strength as long as you’re within a few thousand feet of the signal booster. The amplifier works with the help of an internal antenna that’s responsible for helping send a signal through whatever area the RV 65 is installed. That internal antenna is made to either hang on the wall or ceiling, and can help provide a couple thousand square feet of coverage, depending on the specific conditions of your home. While the amplifier needs to be near an outlet for electricity, it otherwise can be hidden away. It’s not involved in broadcasting, so as long as you provide it with at least a minimal amount of air circulation, it can be conveniently tucked out of sight. When you open the weBoost Connect 4G kit, you’ll find a dozen different components that need assembly. Among them are the included coax cables, both reaching 30-feet, and providing plenty of distance to help you make a connection. There’s also a barrel connector you can use to combine the two cords. The external antenna can be applied with a suction cup, a bracket mount, or with a rooftop pole. Although it should be noted that the RV 65 doesn’t include a rooftop pole, so you’ll have to plan accordingly. Full installation takes about an hour, depending on how good you are with these sorts of manual installs. You’ll need to start by setting up the external antenna, preferably in a high place to reduce interference. A pole mount may or may not help you, depending on the source of the interference you’re experiencing. After you’ve set up the external antenna, you can begin to perform some simple tests to get an idea of the direction of the nearest cell tower. Within your home or RV, the internal antenna should be mounted where you want to receive your signal the clearest. You’ll want to keep the internal and external antenna separate by about 50 feet horizontally and 20 vertically. That separation is important to help protect the two from conflicting with each other during operation. And you’ll want to make sure all of the constituent parts are operational before you start screwing in anything permanently, as it’s common to end up having to make a few adjustments. Installation will require you to run cabling around windows, but any general handyman should be equipped to take on this level of light installation. Once everything is connected, you just flip on the amplifier and begin to enjoy your boosted signal. You may need to take the time to adjust the external antenna to optimize your connection, but if you see a green light on your amplifier terminal, then it means your system is working and your signal can be boosted. Compared to other connection boosters, the weBoost is somewhere in the middle in terms of its price. It doesn’t provide the super-massive 50,000 square feet coverage you’ll see in some amplifiers, but it’s much more powerful than comparably priced amplifiers, especially if you want more than the tiny coverage you typically see in vehicle-based boosters. Although the price is somewhat average, the weBoost Connect RV 65 includes a 2-year warranty, which covers lifetime tech support as well. That kind of support can be a non-trivial concern when you’re dealing with Internet connectivity, and the reasonably lengthy warranty can help you ensure you’ve got a stable product. It’s important to understand that the weBoost can’t create what isn’t there to begin with. It’s great at boosting a weak signal, but it isn’t going to be able to create a signal where there isn’t one to be found. If you’ve got an exceptionally weak signal that borders on being non-existent, the weBoost might not help you in a measurable way. It entirely depends on the source of the obstruction of your signal. For example, if you’re having a problem with your antenna being too low relative to the nearest mobile tower, then the weBoost’s ability to utilize a telescoping pole can fix your problem. But if you’re in an area without a cell tower to begin with, the weBoost Connect can’t help. For people with poor call quality, slower internet, coverage that seems spotty from one place to another, it’s going to be an effective solution. Whether you’re parking the unit in a motorhome or you’re connecting from an RV, the RV 65 is quite effective at helping you better signals in spite of unfavorable environmental conditions. Who Should Choose the weBoost Connect RV 65? The weBoost Connect RV 65 is a good choice for someone who lives in an area that provides spotty reception. If your connection is getting blocked by building material, then the weBoost can completely remedy the problem. 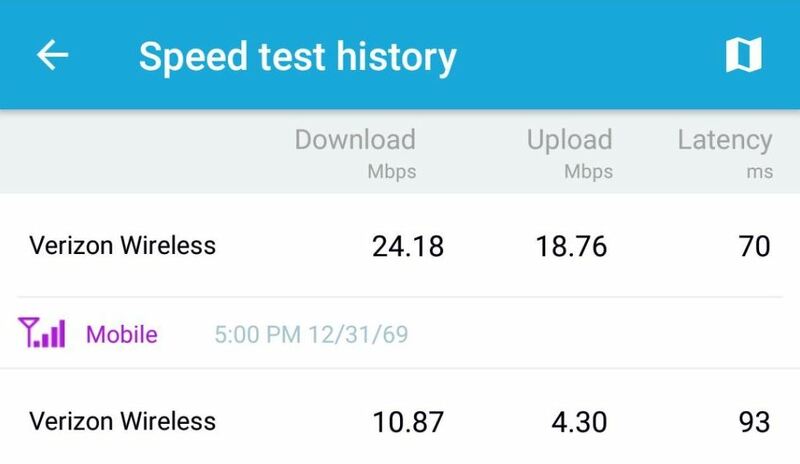 You can see a night and day difference in connection speeds. 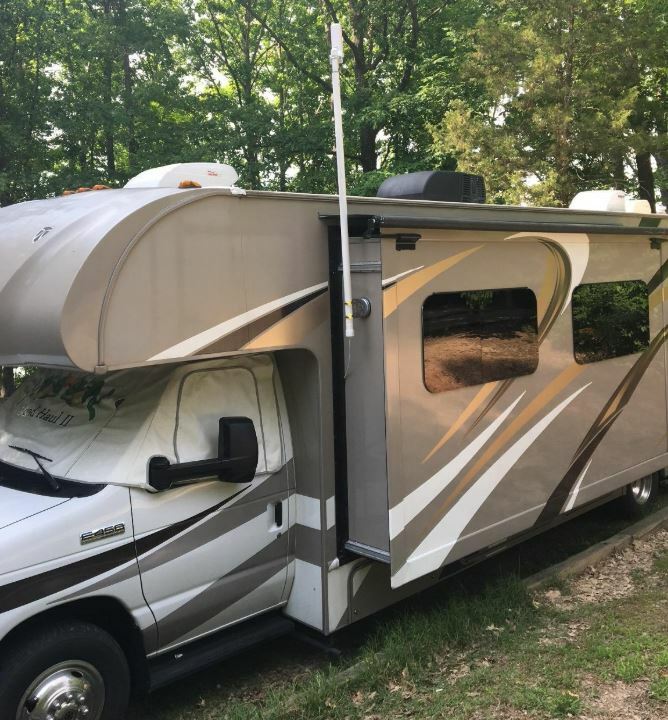 It’s a good choice for people who are taking their RV on the road, and want to maintain as stable a connection as possible while entering uncertain terrain. If you’re only looking to power one small room, like the space of a sedan, then you can find something less expensive than the Connect RV 65. But for covering the area of a large home and boosting faint signals, the RV 65 provides all the necessary hardware. It allows up to 32 times better cell coverage than what you can get from the small antenna within your phone. That better coverage improves your battery life, which can translate into hours of extra talk time. Overall, it’s fair to say that the Connect RV 65 is easy to install. But there is an installation process, and you will have to run cabling between the two antenna. Dealing with routers and Internet connectivity doesn’t have to be intuitive and easy, but the weBoost Connect does everything it can to make things simple. Its indicator lights make troubleshooting and installation relatively intuitive, and if you end up stumbling, weBoost tech support is there to help. Ultimately, the weBoost Connect RV 65 is a good choice for anyone who values having a full set of bars on their smartphone. If you’re looking for a smartphone signal booster for your mobile home or RV, it’s a no-brainer. Even for medium-sized homes, the RV 65 can be an effective solution. After you get through the installation, your life will only get easier. How do we keep the antennas 50 feet apart horizontally in an RV? A large RV is 40 feet and most are much less than that.